Are you one of those people who make New Year’s Resolutions every year only to find that you have dropped one or all of them before the end of February? What about dropping your resolution before the dawn of the double-digit day on the calendar (10th of January)? Many of us are at least one of these individuals; but, we have hope that this will be the year we achieve what we vow to achieve. On behalf of the world I say, CONGRATULATIONS YOU HAVE ACHIEVED YOUR GOAL! I can imagine the confusion that has made its way to your mind along with a scowl as you contemplate why I would congratulate you today, the last day of the month & year. Here’s the reason, you can be a Resolution Success Story but you must revise your plan of attack. Oftentimes we fail to stick to our resolutions because we either a) don’t have a plan of attack, b) try to take off from zero to fifty without a V6 engine, or c) we allow setbacks to destroy our motivation. I think we can all be Success Stories if we reframe our minds to think of resolutions as an appointment on our calendar. 1) Take 5 minutes and think of one thing you would like to accomplish in the New Year. What is the first step which must be taken? Make that first step your resolution of the moment. I know, I know, I hear you saying it in your head – resolution of the moment? Yes, resolution of the moment! Bear with me, it will begin to make sense. 2) Write your resolution of the moment on a post it note, note card, calendar, date book, computer, etc. The point isn’t just to write it down but to write it down on something that is portable and can be placed in an area visible to you throughout today. Make sure you write it clearly and specifically. We don’t want any confusion as to what our first step must be. This is your visible reminder of your goal. 3) Give yourself the target date of 12/31/12. Look at the clock and add four hours to your current time and make that your time deadline for today. Your new target date of completion would be 12/31/12 1:00pm (you insert the time). Place this appointment date and time on your calendar. If your calendar is electronic, arrange for notifications a minimum of two hours before your set time. Allow this notification to be an auditory reminder to take the first step. 4) Follow your daily agenda and find 15 minutes to take that first step. If the goal was exercise, then take the long way around your office on the way to the copy machine or the bathroom. Then take the long way back. If the goal was go back to school, take a few minutes to obtain the phone number for a local university and call to request information. Or go online and request information from the school. The point: DO SOMETHING. 5) When the alarm chides at the end of your four hours, clap your hands and wrap your arms around your body tightly. You have just given yourself a hug and a round of applause. Take that original post it note, notecards, etc that you used in step 1 and make sure you mark it completed and place the date and time. Now figure out what the next step you need to take in the effort to obtain your resolution, and begin the process again. The next step may be to call another university to obtain further information or it could be to walk around the office building a few more times. What better reminder of the mission of The M.I.D.A Project than the holiday of Christmas? The Christmas holiday season motivates and inspires people to help others achieve their dreams. Whether you were one of the Secret Santas spreading holiday joy by paying off others’ lay-away or maybe you were one of the Christmas Angels who pulled a name off a Xmas tree to provide a gift to a person in need, on behalf of America – Thank You. Merry Christmas and thank you to all our military personnel fighting domestically and abroad. A double thank you to each military spouse, dependent, and civilian worker. Thank you to law enforcement, hospital personnel, and emergency dispatchers. This is the time of year in which we need you and don’t have enough ways to say Thanks. Give a smile and a thanks to everyone you meet this week. It may be just the thing to keep them encouraged. One of the quotes I have heard spoken many times is “I’m blessed and highly favored.” This statement exudes appreciation for the things & people we have and awareness that positive things are on the horizon. It has been my experience that the mind set which comes with making that statement, calms the spirit of uncertainty or anxiety. Unfortunately that calm only lasts as long as we allow it. Self-control determines the duration of the calm, and a lack of self-control leads to a precarious balancing act of problems and grief. Ms. Toni had the right idea. We need to remember that giving in to anger means we are not willing to utilize our skills, control, or power. Let me type that again, we willingly give up our skills, control, and power. I see you shaking your head and saying to yourself that it is easy to type/read but a lot harder to do. I hear it! I live it! I believe it! But, I give in to anger too. Hello, my name is ______ and I gave in to my anger. Now that we have gotten that statement out the way, let’s get back to why this matters to you, The M.I.D.A Project readers. Because as Jim Rohn states, “When you know what you want, and want it bad enough, you will find a way to get it”. When we are angry, we lose sight of what we want and we become focused on the person or situation which contributed to the anger. 1) Aim – Be like the archer: Aim for the bulls eye in the center of the target. Your bulls eye is the activity you partake in that allows you to relax and regain control. Your target is the goal you are working to obtain. 2) Need – One of your needs was not met. That is the true reason for your anger. After you have regained control of yourself, identify how you can met this need for yourself in the future. This puts the responsibility for controlling the situation back in your lap. 3) Gratitude – Give yourself permission to take a minute and think about what your blessings. Everyone has at least one thing to be grateful even if it is as simple as life, the ability to read, or access to a technological device that lets you read this post. (I am extremely grateful for your tech access). 4) Remember & return – Remember you are worth a million dollars but only if you return your focus to your dreams. Anger pulls you off course and the time you spend being angry will keep you from making that million dollars. 5) You – The only person you can change is yourself. That is the only person you have control over. Trying to change others is a waste of time and you need all your time to focus on your dreams. Here’s hoping we all learn to conquer anger so that we don’t find ourselves in danger of losing out on achieving our dreams. Today I selected my podcast of the month, I know the month is practically over but I used my power of perception and decided to recommend a fast, easy & informative podcast for your review. Of course I can only categorize it as a nice easy listen due to the length of each episode. It’s not too long but also not too short. The time is filled with useful excerpts from various teachings by the founder mixed in with interviews from leading authorities on business and personal development. I chose to finish this month with a podcast whose name may be familiar to many of you but if not, I get the honor of introducing you. Before I let my choice be known, I wanted to share the reason for my selection of a podcast. The purpose of this blog is to motivate and inspire. One of the issues with this purpose for today’s society is that many people are pulled in several different locations and allow themselves to become overwhelmed and/or filled with anxiety over the process of personal development. Podcasts are a great small step up the ladder towards achieving your dreams. I use the ladder analogy because when climbing ladders, we often fall backwards when we try to skip more than 2-3 rungs. This skipping motion sets us off balance and thus we end up right back where we began. The trick to successfully climbing the ladder is to take it one rung at a time. Henceforth, I am beginning with a podcast entitled Entreleadership. The podcast is built around the teachings of Dave Ramsey from his Entreleadership Master Class as well as the book of the same name. Please note this is a podcast I enjoy but that doesn’t guarantee you will. It is your choice to give it a try. It is a free podcast and you can listen from any of your tech devices. 3. Make it a routine, choose a time frame to listen which is conducive to listening to the episode in its entirety. Selecting a time frame will allow you to make this a part of your daily agenda. Well that is my selection for the month, listen and tell me what you think. Do you have any suggestions for a great listen? Leave me a comment and I will follow-up. If you are struggling with the concept that you, yes you, can become great then this post is for you. Actually this post is for everyone who has, will, or are currently struggling with your self-confidence. This current moment of self-doubt is as temporary as you allow it. And hopefully, you will encourage it to have a brief stay in your heart. There are lots of things we can do to lift our self-esteem but one in particular, I think deserves mentioning: the use of affirmations. Affirmations are simply the act of giving yourself a pep talk. Motivational speaker Brian Tracy recently shared the post “Repeat Positive Affirmations for a Happy, Healthy Life” in which he shares his views on the routine use of affirmations. He has also created the 30 Day Affirmation Challenge. I have chosen to participate in this challenge and I am pleased to announce I am on day 6 and it has made me a believer. After all, “A happy life consists in tranquility of mind.” – Cicero. As with all new things, consistency is key and this new practice will require you to include it in your daily schedule. That’s the beauty of the challenge, it allows you to establish a positive habit. So join me and the countless others who have accepted this challenge because “Faith in oneself is the best and safest course” – Michelangelo. 1) For the grand ole price of $0, I got more than my money’s worth. Not only are the tips adaptable to each readers life circumstances, they are also explained simply and logically with completed examples from the author. 2) The book was shorter in length than I anticipated so it could realistically take the reader a few days to get through it. It took me a little longer than I anticipated because, well, I have a two-year old at home. Not withstanding the toddler who continually interrupted me, the writer made a boring topic interesting and thus it held my interest. 3) The author included links to her website where she had additional tools to assist her readers in making over their schedules. Each link was included within the explanation for the activity of the chapter. This gift allows the reader to have a place to return and get additional tips along the scheduling process. So how do you refocus your energies when you either 1) don’t want to or 2) have gotten distracted and off course? Step 1: You remind yourself of the why? Why is this task, job, or project important to you? Step 2: You identify the what? What is blocking you from success or completion? Step 3: You surround your environment with the how? How can you make your environment more conducive to success? Step 1 – If you are like me and work for someone else, the why could easily be because your boss said so. But that reason doesn’t help me get my early Monday Pre-phone call Mojo back. So I prefer to focus on this thought, “I do what I do because it increases my skill set and allows me to broaden by opportunities for advancement.” That usually works to give me a kick in the pants but when it doesn’t I move on to step 2. 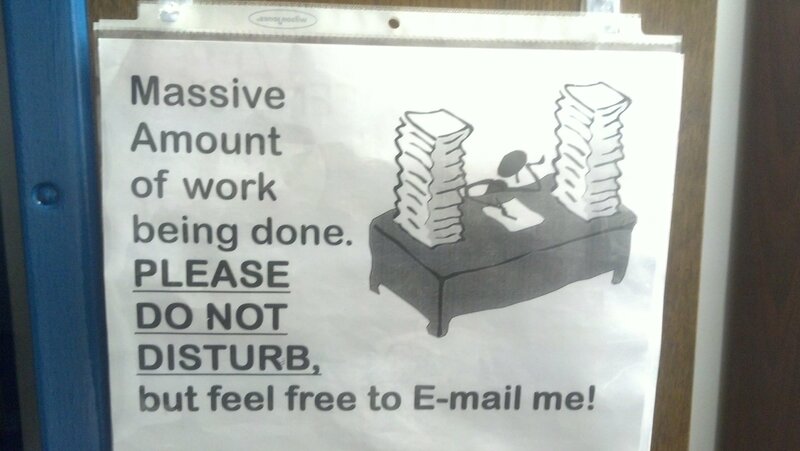 Step 2 – Blocking me from completion is usually constant interruption so I force myself to sit at my desk for a minimum of two hours with a sign on the office door of the picture on this post. (it is the actual posting that hangs on my door) Once the door is closed I have another posting of the quote “Procrastination is the Assassination of Motivation” by Anthony Robbins. The point of all this for me is that I identify what is keeping me from getting the task done. I am easily distracted so this helps me. But you may not have the option of closing your door and posting materials which will allow you uninterrupted time so that is when step 3 becomes handy. Step 3 – The environment you work in has a lot to do with your comfort and productivity. Some people find it soothing to have an office decorated like their home, others like nothing but white walls and office equipment, while still others can make a cubicle look like a celebrity decorated Manhattan apartment. Whatever the decor the important thing is to make your environment conducive to you. Surround yourself with items which make you feel good. The better you feel the harder you work. Find your productivity killer and send it on all expense paid trip to the Twilight Zone and you will find that Mondays aren’t so bad after all.